Since Alpine Dog Ranch offers dog training and boot camps up in the mountains I get alot of cries for help from dog owners who are struggling with their dogs who show aggressive behavior towards other dogs. Aah, the good old dog fight. There is nothing more unnerving and scarry than finding oneself in the middle of a dog fight! 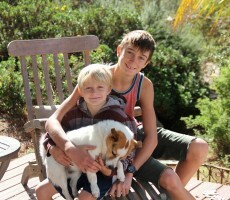 Victor, my ten year old, 20 lb Jack Russel mix is the seargent major at the ranch and he thinks he is invincible! They say cats have nine lives but I think he will probably top it before he dies with the number of times he has been in the jaws of death! Before moving up to the ranch we lived in Laguna Beach. We shared an old wooden fence with our neighbours who had a rotty and a mastiv mix. The dogs looked tough but sounded even tougher. This made no impression on Victor who loved to tear up and down on our side of the fence taunting the monsters to a dule. I would hear the game begin and immediately call Victor in. Oneday during a fence battle I heard his destressed yelping and my heart sank. “Oh Victor, not again” I said as he came running to me with a bloody gash out of his nose. He had managed to get his nose under the fence in an attempt to see what the monsters on the other side looked like. One of them apparently didn’t like his nose on their side of the fence. I cleaned up and doctored his nose and he kept away from the fence for a day or two and I thought maybe he learned his lesson. No sooner had his nose healed, he was back to his old tricks tormenting the dogs on the other side of the fence. One afternoon I heard the commotion begin and then suddenly end. I continued working in my office but then the silence lingered for a little too long. I went out calling for Victor and he had disapeared. I slowly moved down the fence to where I had blocked the hole he had dug and to my horror my repair job had been compromised. The hole had grown large, large enough for an escape route to death for little pooches! I was convinced that was the last I had seen of Victor and gingerely climbed up on the fence to peer over. There on the other side were the two monster dogs towering over Victor who was looking up at them rather sheepishly. They weren’t fighting but fortunatley for him must have had full tummies as they were smelling his rear end and actually seemed interested in the little menace! I was however, overcome with the fight and flight reflex and sprang over the fence, grabbed Victor and sprang with one leap back over to safety. We rescued Victor as a young pup and made the mistake of not socializing him with other dogs. He always seemed agro with other dogs so we just found it easier not to worry. I loved hiking with him in the mountains and if another dog passed by he would jump for its neck or bark and growl. For such a little guy he had a serious Napoleon complex. I like many of you I’m sure, made the mistake of ommition. We fail to socialize our dogs. After interviewing the dog owners who come seeking help, most times the dogs have not been socialized enough when they are puppies. Often dogs are really social as puppies and then as they near one and a half or two years old they get more testy and aggressive or try to dominate other dogs. Most times if a fight breaks out at the dog park or in the street involving our pup we stop socializing her/him. We want to avoid injury or stress to our dog or others. We fear our dog will fight or be aggressive with other dogs. Our dog feels our fear and acts out of fear herself when confronted by another dog and a dog fight is the result. Sound familiar? So what can we do to avoid our dogs getting aggresive? 2. Be the pack leader to your dog. Especially during those teenage years! Your pup will test you on all fronts. Be firm and disciplined. Stick to your rules and don’t let him take advantage of you. If he gets in a squable don’t shy away from keeping him interacting with other dogs. I recently had a real severe case of a dog with fear aggression. She wanted to kill any dog, large or small that came into her space. I had to force her to confront her fear. I put a muzzle on her and forced her to socialize with fifteen dogs at a time, all smelling her rear, licking her face, etc. I would make her lie down and submit in the presence of the other dogs who would hover over her and sniff her. I did this over and over until she eventually would calm down and realise that the other dogs were not going to hurt her or threaten her. Over time I wanted her to realize that she was not Alpha and did not need to be. 3. If you notice the aggression and you feel illequiped to deal with it, GET HELP immediately before the situatiuon gets worse. Don’t wait five years and then try get help! Although its never to late, it takes alot more time to rid older dogs of there aggression because of years of conditioned responses to other dogs. It takes months if not years of intense training to recondition aggresive dogs. 4. Obviously aggresive dogs are not welcome in public places like the dog park or beach. Be prepared to control your environment and your dog. If you go for a walk take a stick along in case you meet an aggressive dog or need to keep another dog away from your dog. Sometimes a muzzle is a solution to prevent you having fear, which your dog could sense, andit could prevent your dog from injuring another. It might make your pup look more scary but other dog owners would rather have an unpredictable scary dog muzzled than deal with dog fights, law suits and huge vet bills. 5. If your dog does get into a fight, never put your hand in between them in an attempt to break them apart. Loud shouting or clapping can startle them and stop them. If not, hosing them with water, ramming a chair or a stick through the middle of them, grabbing them by the back leg or leggs can help seperate them. If you do experiense the traumatic event of a dog fight , you are not alone. Reach out to others to help face your own feelings of fear and sadness, stress or anger. Victor is now daily inundated with doggie friends at the dog ranch. He does a lot better and tolerates most of his new friends. Sometimes he will look me in the eye and say, ” Why in the world do I have to share my house with 15 other dogs!” I smile and throw him a treat. “You will survive!” I say. He does get some special perks since he is now the senior citizen with enough scars to prove his wisdom and toughness!